Colossal will likely be remembered as a perfect, self-referential comeback vehicle for star Anne Hathaway. Colossal, writer/director Nacho Vigalondo’s new film about a drunken American woman’s mysterious connection to a giant monster attacking South Korea, features incredible central performances, a fantastically weird and creative premise and tragic, compelling central themes, yet somehow ends up feeling like less than the sum of its parts. Still, it’s impossible to ignore the quality on display here. Spanish director Vigalondo, who first made waves stateside a decade ago with 2007’s Timecrimes, cements himself as a filmmaker to watch. Jason Sudeikis is amazing in a role that calls for him to serve as comic relief, a romantic lead, a pitiable fool and a horrifying villain, and he showcases the variety that served him so well on “Saturday Night Live” along with a subtlety and texture that rounds his character out believably. 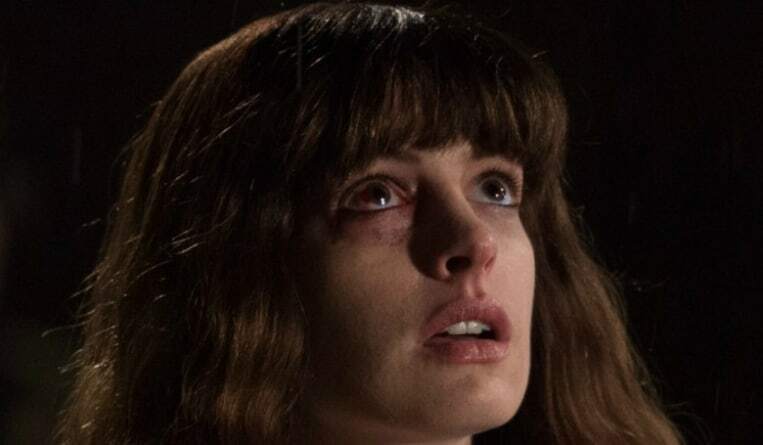 And though it deserves to be noticed for many things, Colossal will likely be remembered as a perfect, self-referential comeback vehicle for star Anne Hathaway. Hathaway, who for years has been subjected to a frightening amount of sexist backlash, particularly from anonymous online trolls, digs into the central role of Gloria, a character who is also a target for weak men. Hathaway’s performance is every bit as raw as her Oscar-winning turn in Les Miserable, but unlike that film Hathaway isn’t forced, as actresses so often are, to starve and mutilate herself onscreen to earn accolades. Instead, Hathaway paints Gloria as completely and believably unlikable. She’s lost the writing job that allowed her to escape her small hometown and move to the big city and now spends her days partying in her boyfriend Tim’s apartment. Colossal lays the groundwork for subversion early, and at the beginning, it is hard to not sympathize with Gloria’s boyfriend (played with uptight precision by Beauty and the Beast’s Dan Stevens) when he kicks her out. Gloria returns to her hometown, where she squats in her empty childhood home while waiting for Tim to take her back. While on an excursion to purchase an air mattress, Gloria runs into her childhood friend, Oscar (Sudeikis). Oscar initially seems so kind and generous that the first half of Colossal could easily be confused for a romantic comedy, albeit one with a kaiju twist. This kaiju, of course, is what initially sets Colossal apart. News reports of global destruction in Seoul, South Korea break up scenes of Gloria sucking at life. And though the film’s marketing has revealed much of it, Gloria’s connection to the monster comes off as a delightful surprise, albeit a dark one when you consider that, in Colossal’s universe, Gloria’s drunken behavior causes the death of hundreds of South Koreans. As Gloria takes a job in Oscar’s bar and slowly begins to unravel the mystery of her relationship to the giant creature, Oscar makes a discovery of his own. When he does, Colossal shifts from a romantic comedy to an exploration of toxic masculinity. Sudeikis beautifully portrays the reveal of Oscar’s inner self, as the tentacles of his deep jealousy of Gloria slither to the surface. For her part, Gloria slowly becomes a better person, but it’s a testament to Colossal that she doesn’t simply get sober and suddenly have everything work out for her. Instead, she assumes responsibility for her giant monster connection and slowly becomes a protector of the same people she was accidentally slaughtering earlier in the film. She also learns to face down Oscar and Tim both, and Colossal subverts our expectations but making them both villains, leaving Gloria with only her gentle, stupid, spineless boy toy Joel (a sweet Austin Stowell) as a love interest. Ultimately, Gloria doesn’t need a lover. As she learns to stand on her own feet, Colossal reveals a surprise bigger than its giant monster, which is that it’s actually a story about Gloria learning to stand up for herself. Though there are many powerful elements to Colossal, not all of these components completely gel. The film lags, despite its bombastic concept and swift runtime. And though Sudeikis’ portrayal of Oscar is exceptional, he is given far too many long, meandering scenes to cause damage once his treachery is revealed. The film can’t seem to find a balance between its comic style and dark themes, and as a result some scenes aren’t given the appropriate dramatic weight. Finally, there is something a bit jarring about white people playing so fast and loose with Asian lives, and the lack of commentary on the subject feels like a glaring oversight. It could be powerful if Vigalondo were making a point about basically unemployed, privileged white people holding the lives of thousands of Asians in their hands, but the fact that he isn’t ends up making Colossal feel out of touch. Colossal could have been great, which makes its flaws all the more disappointing, but in the absence of greatness, it is still a very worthwhile film. Its central conceit is utterly brilliant, and the performances are exceptional. Anne Hathaway, in particular, shows why she is one of the most talented actors of her generation, and hopefully her self-aware performance will silence or at least chasten some of her critics. Colossal is an excellent showcase for her talents and also an example of truly unique filmmaking, which Vigalondo achieves by taking unrelated, familiar concepts and rearranging them into something that has never been seen before.